For other uses, see Jamaican (disambiguation). 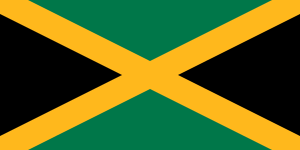 Jamaicans are the citizens of Jamaica and their descendants in the Jamaican diaspora. Most Jamaicans are of African descent, with smaller minorities of Europeans, East Indians, Chinese and others or mixed ancestry. The bulk of the Jamaican diaspora resides in other Anglophone countries, namely Australia, Canada, United States and the United Kingdom and, to a lesser extent, other Caribbean countries and Commonwealth realms. Outside of Anglophone countries, the largest diaspora of Jamaicans lies in Costa Rica, where Jamaicans make up a significant percentage of the population. According to the official Jamaica Population Census of 1970, ethnic origins categories in Jamaica include Black, Chinese, Mixed, East Indian, White and ‘other’ category eg: Syrian or Lebanese. Jamaicans of African or partial African descent made up 89.4% of the working population. Those of non-African mixed race were the second most prominent labour group, making up 6% of the population. Responses of the 2011 census. Many Jamaicans now live overseas and outside Jamaica, while many have migrated to Anglophone countries, including over 400,000 Jamaicans in the United Kingdom, over 300,000 Canada, 800,000 in the United States. There are about 30,000 Jamaicans residing in other CARICOM member including the Bahamas (5,600), Cuba (5,000), Antigua & Barbuda, Barbados and Trinidad & Tobago. There are also communities of Jamaican descendants in Central America, particularly Costa Rica, Nicaragua, and Panama. Most of Costa Rica's Afro-Costa Rican and Mulatto population, which combined represents about 7% of the total population, is of Jamaican descent. ^ Ethnic origins, 2006 counts, for Canada, provinces and territories - 20% sample data, Statistics Canada (2006). Retrieved on August 11, 2008. ^ a b c d e "World Migration". iom.int. 15 January 2015. ^ "The Nassau Guardian Home - The Nassau Guardian". The Nassau Guardian. ^ Jamaica Population Census 1970. ^ a b Project, Joshua. "People Groups - Joshua Project". www.joshuaproject.net. ^ "30,000 Jamaicans residing in other CARICOM member states". caricomnews.net.